Workshop for Cabinet Secretaries and other senior officials from Cabinet secretariats providing further support on evidence-based decision-making and Cabinet procedures. Roundtable Participants with H.E. 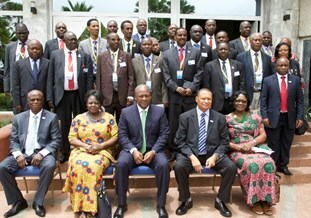 John Dramani Mahama, President of Ghana (front, centre). "Africa needs home-grown solutions to our unique challenges. We need also to tell our own stories of success, and learn from our own failures. History is made by people who are daring enough to learn from their own mistakes. Your organization is leading the way in using a peer learning approach to enrich the African experience in policy making and implementation; and now, this Roundtable will set the parameters for understanding transparency and accountability in policy making in Africa." H.E. 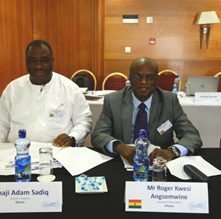 John Dramani Mahama, President of Ghana, officially opening the 2015 ACGN Roundtable. H.E. 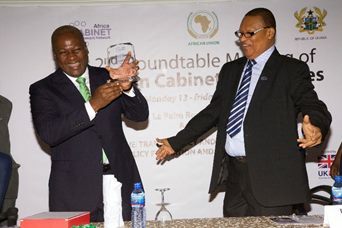 John Dramani Mahama, President of Ghana received an award presented by Dr Ernest Surrur, President of the Council of African Cabinet Secretaries. Copy of the President's keynote address. Workshop for West African Cabinet secretariat staff on reviewing and briefing on policy proposals prepared for Cabinet. Workshop for Cabinet secretariat staff focusing on use of evidence in policy proposals.